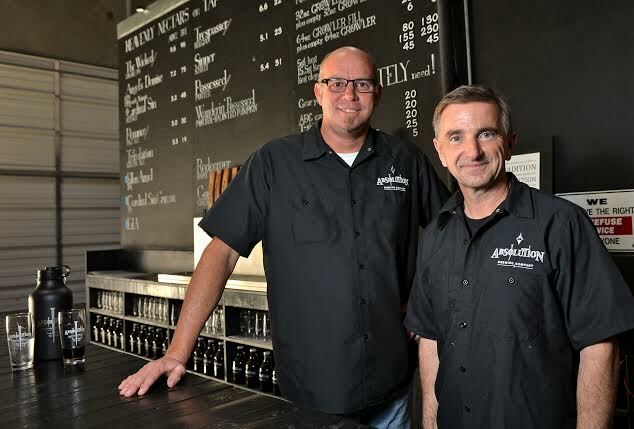 Blessed with beer: Steve Farguson, left, vice president of sales, and Nigel Heath, self-described chief tasting officer (and CEO), are two of the three partners behind the latest entrant into the fast-growing Torrance and South Bay craft beer scene, Absolution Brewing Co. (Photo by Staff Photographer Robert Casillas). Torrance’s Absolution Brewing Company opens its doors for the first time Saturday. Read more here.